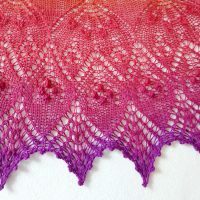 Inspired by the sunrise colors of this gorgeous yarn, the Tequila Sunrise shawl perfectly depicts the sun’s breaking light across the horizon. 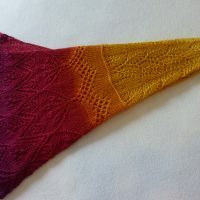 The pattern; a sun with rays spanning across golden grains of wheat, blend to a rich mango yellow, beautiful burgundy red, and finally to a show-stopping purple gradient. 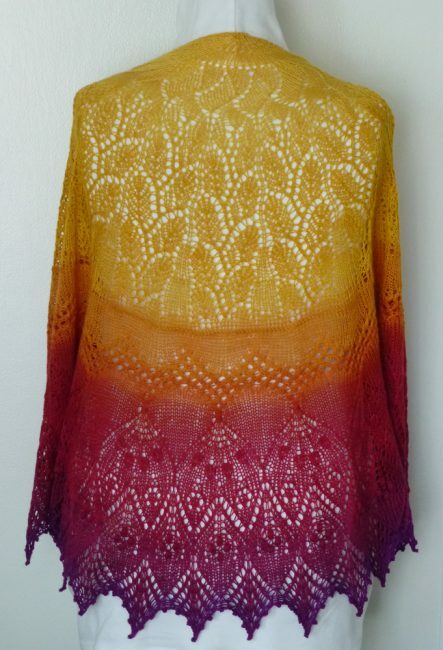 Hand-knit in beautiful Merino and silk, this is the perfect accessory to wear anytime you to experience your own beautiful sunrise. 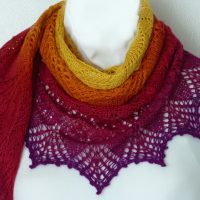 I won this yarn in a monthly gradient forum contest and I’m impressed by the vibrant color. So beautiful it inspired me to create this mash-up of patterns to represent a gorgeous sunrise. 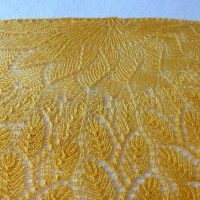 I started with the Rushing Tide Shawl sun, then morphed into the golden shafts of wheat in the Heliotaxis shawl, the a nice crisp Vikkel braid stitch to start the Follow Your Arrow 2 clues. Absolutely love how it turned out. I just wish it were colors I could wear. I’m sure someone out there thought, that loves wearing these colors and will buy it at the store. Color: Yellow to orange to red to purple gradient. Size: Measures 68″ wide, 32″ tall. Close up of sun motif. *Special thanks to Panorama Fiber Arts for creating such beautiful yarn.